Ghiyas-ud-din Tughluq also known as Tughluq Shah was appointed as the governor of Dipalpor in Punjab by Allauddin Khilji. The rule of Ghiyjas-ud-din Tughluq includes the suppression of the revolt at Warangal. Pratap Rudradeva of Warangal had accepted overlordship of Allauddin Khilji and agreed to pay tribute annually. After the death of Allauddin Khilji he neglected this. Ghiyas-ud-din sent his son Juna Khan to conquer Warrangal. In 1323 AD Rudra Pratap Deva was defeated. Warangal was renamed as Sultanpur and annexed to Delhi. 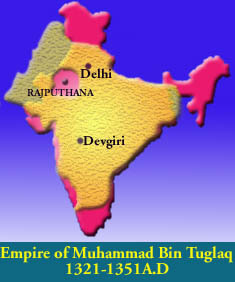 Muhammad-bin-Tughlaq came to the throne in 1325 AD. The rule of Muhammad-bin-Tughluq includes various reforms. The first of these reforms included his attempt to consolidate his empire by curbing the rebellions of 1327 AD by his cousin Baha-ud-din Garsharp in the Deccan and the other of Kishulu Khan, the governor of Multan and Sind in 1328AD. Muhammad-bin-Tughlaq's experiments with his ideas of administration are noteworthy. The transfer of his capital from Delhi to Daulatbad earlier known as Devagiri. This transfer of capital involved the shifting of the army, officials, servants, tradesman, court and shift of population. This was a torture of the people who suffered greatly. The introduction of token currency brought discredit to his rule. The rampant circulation of copper coin and withdrawal of silver and gold coins brought down the value of currency. Copper coins lost its value. To overcome this the Sultan ordered exchange of silver coins for copper coins. Thus people got silver coins in abundance and copper coins were in heaps. The taxation in Doab which resulted out of the conditions of an empty treasury and the scheme which was implemented in a wayward manner made it a failure. The conquest of Khorasan which required a strong army and later disbanding it was an act of instability. Muhammad bin Tughluq's engagements with his domestic affairs made him turn a blind eye to the Mongols who made use of his opportunity and invaded India in 1328 AD. The shifting of the capital from Delhi to Devagiri also proved advantageous to the Mongols, as they prepared for more conquests. The Sultan's ambitions plan of invading Himachal and the devastationof his army owing to inhospitable climatewas another blunder by Mohammed-bin -Tughluq. An attempt to capture Malabar in 1335 AD failed owing to the spread of Cholera in the army. In1338 Fakhruddin Mubarak of Bengal declared himself independent. In 1340 the Governor of Gujarat declared himself independent. The Sultan faced problems from the Afghans led by Hasan Gangu . In 1350 AD the province of Gujarat revolted and under Taghi. Pursuing the enemy to inflict punishment, unfortunated Mohammed bin-Tughluq died out of illness. He was succeeded by his cousin Feroz Tughlug who was delivered of a Rajput mother. Feroze Tughlaq became the Sultan in the year 1351 AD. Though the throne was a long dream of many. Feroz Tughlak did not contribute much to expand the territories of the empire which he inherited. His military weakness resulted in the loss of his territories. He failed in his attempt to regain Bengal. In 1360 he invaded Jajnagar to destroy the Jagan nath Puri temple. In 1326 AD he met with success in his expedition to Sindh, before this he had led an invasion Nagarkot with an idea to destroy the Jwalamukhi temples. The Sultan was not tolerant towards people with different religion. He reintroduced the Jagirdari system which was abolished by Alauddin Khilji's. All these measures brought a good result in the financial status of the empire. Feroz Tughluq also introduced reforms in the field of irrigation. He constructed dams, tanks and well and besides these also constructed buildings with architectural skill. This shows his awareness about public utility. Feroze Tughluq also patronized learning. He reformed the currency system. All these proves that he was the cast of the capable Tughluqs. After him the dynasty began to disintegrate. He was immediately succeeded by Ghias- uddin Tughlaq-II who ruled from 1388-1389 AD. He was murdered in 1389 AD and was succeeded by Abu Baker. In a struggle that followed between him and one of the sons of Feroze Tughlaq Abu Baker was defeated. The younger son of Feroze Tughluq. Nasir ud-din Muhammad ruled from 1390-1394 AD. He died in 1394 AD and was succeeded by Humayun. After his death in 1395 the Tughluq dynasty saw the last Tughluq ruler Mahmud Nasir-uddin. He ruled from 1395-1413 AD. The invasion of Timur sealed the fate of the Tughluq dynasty. After the Tughluk dynasty Indian history witnessed the rule of the Saiyyids and the Lodis. The foundation of these two kingdoms was on the rubbles of the Tughluq's which was grazed to the ground as a result of Timur's invasion. Timur was a Barlas Turk. Born in 1336 AD he grew up with a military skill that made him a military genius. He attained the throne of Samargand in 1369 AD. With a zeal of conquering distant lands he set out and conquered several central Asian territories before turning towards India. With an ambition to possess a large territory, besides acquiring enough wealth and with an awareness about the disintegrating Delhi Sultanate he invaded beyond the Indus with a powerful army. Timur's grandson Pir Muhammad had conquered Multan, Ulch, Pakpatan and Dipal-pur. Both proceeded towards Delhi and defeated Sultan Muhammad Shah. He then conquered Meerut and Haridwar. Besides conquering these territories he looted the wealth of the temples. He nominated Khizr Khan as his governor in India. Thus the political stability of the country was disrupted and the condition that prevailed then ultimately resulted in the downfall of the Tughlaqs.